Supporting refugees is not just charity but helping refugees can be good for business. American consumers are more likely to purchase from brands that support refugees, according to a new report from the NYU Stern School of Business and the Tent Partnership for Refugees. Despite rising polarization on refugee policy in the United States, research shows that consumers, particularly millennials, prefer brands that commit to helping refugees. 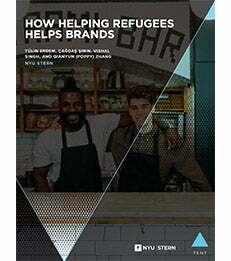 The report, “How Helping Refugees Helps Brands,” utilized an online survey of more than 7,000 U.S. consumers to analyze how consumers respond to brands’ efforts to support refugees. The report finds that, across a wide range of demographics, consumers respond positively to a variety of business efforts to support refugees, including hiring refugees, delivering services to refugees, investing in refugee entrepreneurs, and sourcing from refugee businesses. On average, the younger the consumer, the more positively they respond to brand support for refugees. Millennials, by significant margins, are more likely to purchase a brand if they know the brand is committed to supporting refugees in one or more ways – a powerful finding, given that millennials’ annual spending power is projected to reach $1.4 trillion in the U.S. by 2020. For example, while 48 percent of millennials are more likely to purchase a brand committing to extend financial, educational, or other services to refugees, only 10 percent are less likely to do so. Similarly, 44 percent of millennials are more likely to purchase a brand committing to hire refugees in the United States, compared to 11 percent that are less likely to do so. Overall, the survey indicates overwhelmingly positive reactions to most types of brand support for refugees regardless of age. The report also finds that consumers’ responses vary depending on whether brands focus on helping refugees in the United States or those overseas. Self-identified conservative consumers and older consumers, for example, are more likely to respond positively to brand commitments to hire refugees overseas. With almost 90 percent of refugees residing in low- and middle-income countries, this highlights another clear path for brands to provide meaningful support for refugees. The full report can be accessed online. Tent believes that companies have the greatest impact when they treat refugees not as victims, but as economically-productive workers, suppliers, entrepreneurs, and customers - and when they leverage their core business operations to hire refugees, integrate them into supply chains, invest in refugees, and deliver services to them. Learn more about Tent: http://www.tent.org.